Tucked away in a small village near Anantapur of Andhra Pradesh, is this little village called Lepakshi. 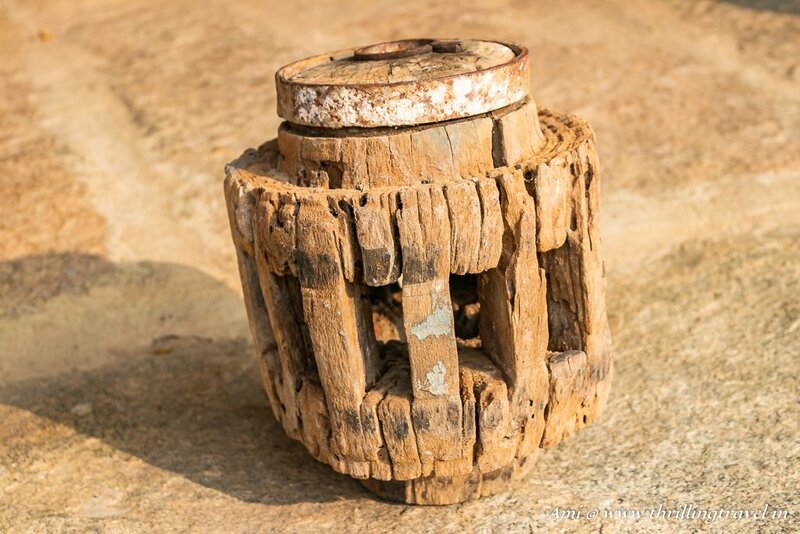 The village is known for its amazing 16th century treasures. A day trip from Bangalore, the village is around 140 km from the city. A perfect distance for a family picnic or an awesome bike ride. Such is the beauty that one visit was just not enough for me. I had to take a small diversion on my way back from Gandikota. I visited Lepakshi again. The little village has three major sites for its visitors. 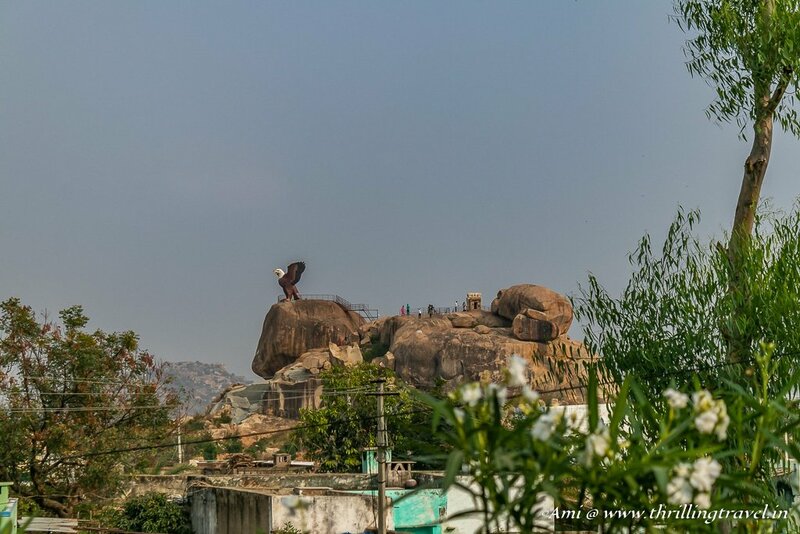 The first being one of the largest Nandi statue, the 2nd being the beautiful Veerabhadra Swamy Temple and the last being the hillock with a statue of Jatayu on it. 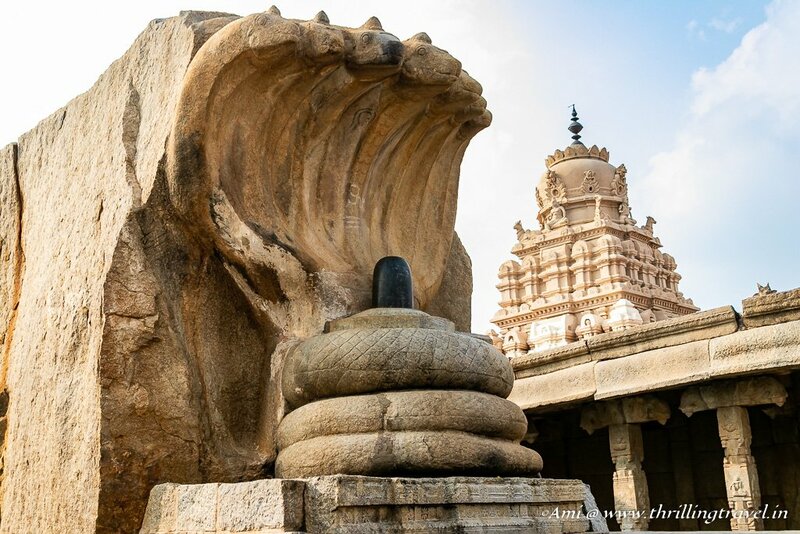 What you find in each of these is what makes Lepakshi – a must-visit attraction around Bangalore. The name Lepakshi refers to a phrase in Telugu – “Le Pakshi”. The words literally, mean “Rise Bird’ and as the legend goes, were uttered by Lord Rama. As the story goes in Ramayana, when Sita was being abducted by Ravana, a vulture called Jatayu tried to stop the demon. Unfortunately, he was wounded and fell down in this village. When Lord Rama followed the trail of abduction, he saw the wounded Jatayu and said “Le Pakshi (Rise Bird)“. And thus, the name of the place. The village might be older than the structures that you find here. The temple complex and the structures around it date back to the 16th century. 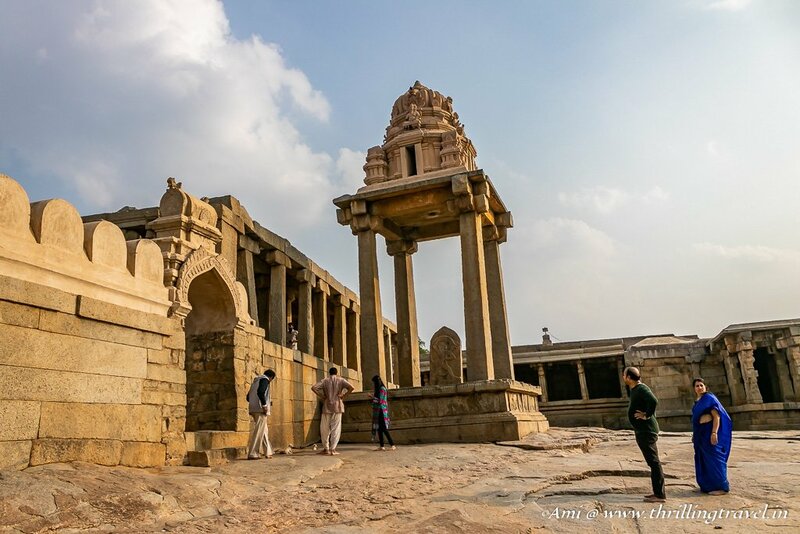 The architectural style can be easily identified as the Vijayanagara Style. 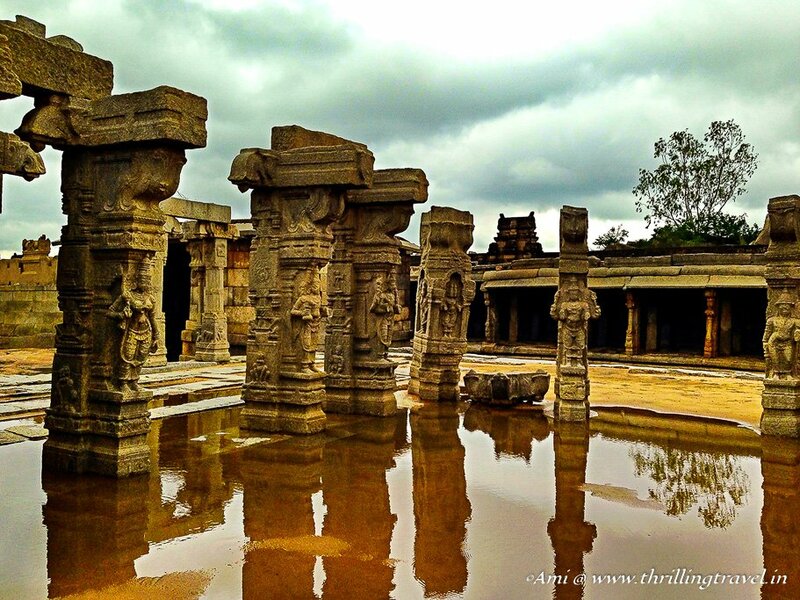 A visit here is like a preview to the gorgeous ghost city of Hampi. 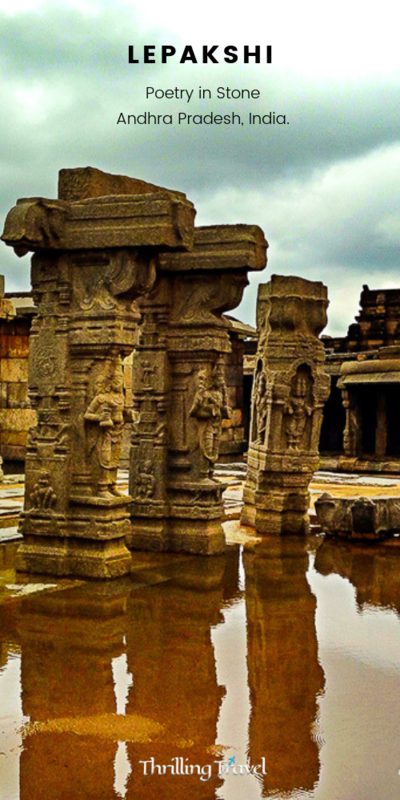 Time to discover it all with a glimpse of the key things to see in Lepakshi. 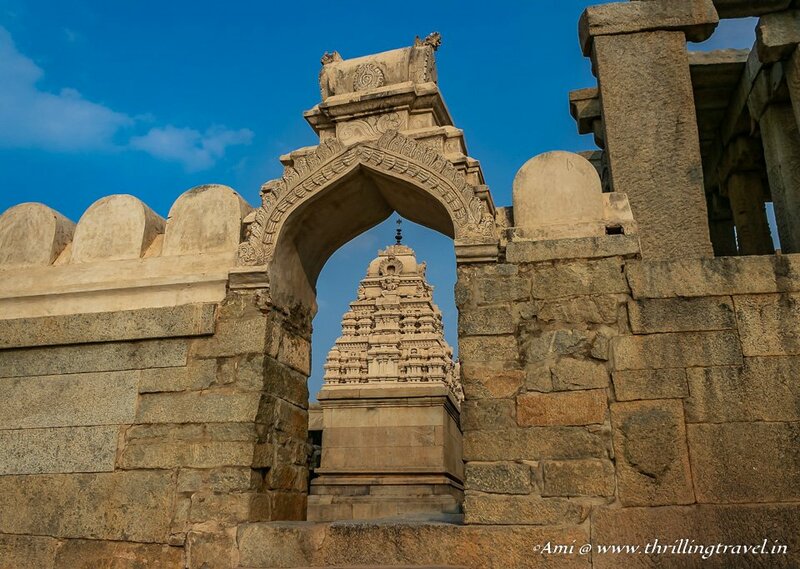 A short walk away from the Lepakshi Nandi is the Veerabhadra Temple. 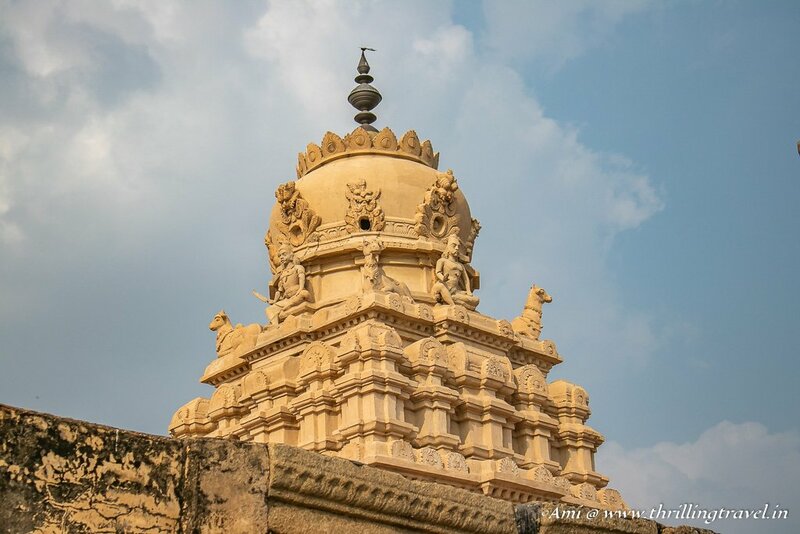 The temple was built during the rule of King Achutaraya of Vijayanagar Kingdom. 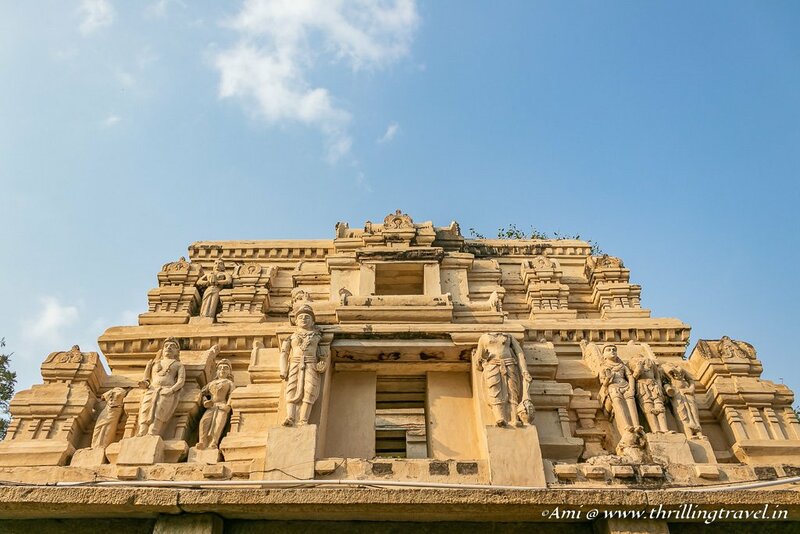 The story behind the temple is centered around 2 brothers – Veeranna and Virupanna. They were governors in the court of King Achyutaraya. They are said to have used the funds from the court to build this temple. Virupanna in particular, was found guilty and as a punishment, was blinded. Some say that he punished himself and left the mark of his bleeding eyes on the walls of this very temple. As you go along with me on a tour of this temple, you will come across the open air Kalyana Mandapa. A wall opposite to that bears the mark of the bleeding eyes of Virupanna. Legend also, has it that the word Lepakshi might have originated owing to this incident. When split as “Lepa Akshi” – they mean bleeding eyes. 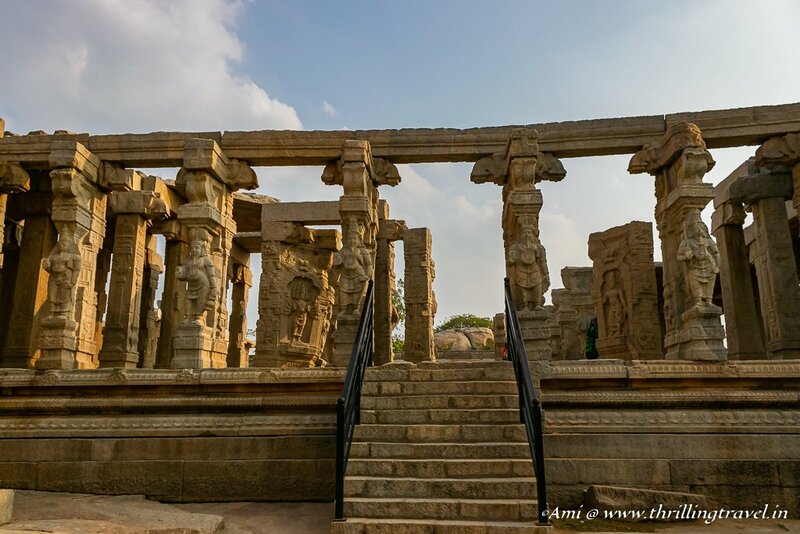 As you walk the outer corridor of the Lepakshi temple, you will come across a site that is securely roped. The place might seem a little ordinary to you until you look close upon its surface. The place is full of Kannada text that supposedly describes certain milestones related to the temple. The language choice (Kannada Vs. Telugu) is evident as this was under the Vijayanagara rule. It is only now that Lepakshi falls into another state. 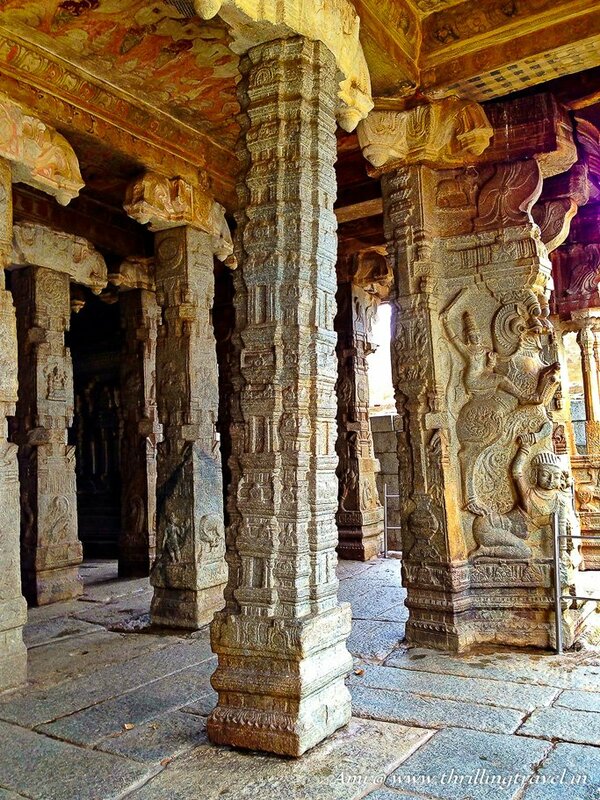 While you are busy deciphering the texts on the rock, spare a glance at the lovely pillars in the outer corridor. Somewhere along those, you will find an ancient lamp. Quite a simple and pretty one, this one was left abandoned for the guides to explain. The Kannada inscriptions in Veerabhadra temple is not just limited to this one site. You will find them on the walls of the main temple as well as a few other pieces too. All you have to do is watch out for them. 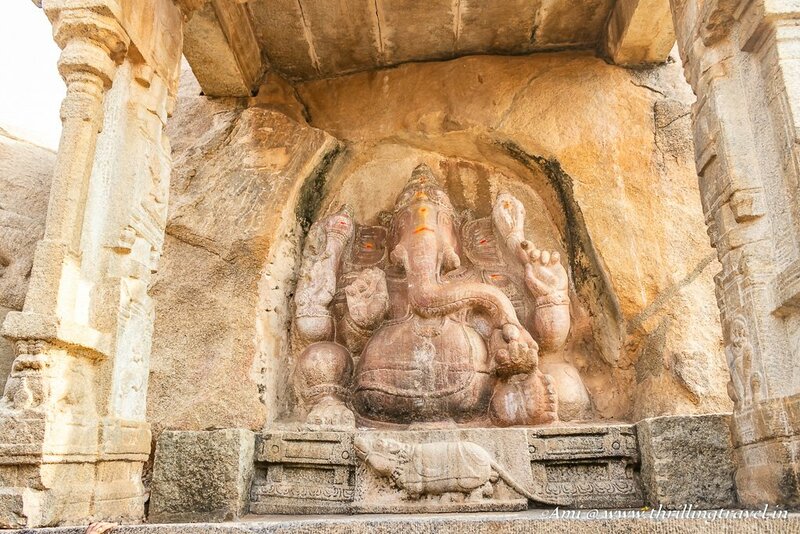 The first time around I entered the main Lepakshi temple and made my way to this Ganesha later. This time though, I followed a guide to enter the temple from the other end and see the Ganesha almost immediately. Visiting something the 2nd time around allows you to see things that you missed the first time. A detailed examination of this monolithic Ganesha allowed me to spot a snake tied around its belly. For those of you who have been to Hampi or seen my post on the Virupaksha temple, you should be able to spot the similarity. It is akin to the Sasivekalu Ganesha – only smaller. 😉 Also, don’t miss Lord Ganesha’s divine vehicle – his cute mouse at his feet. 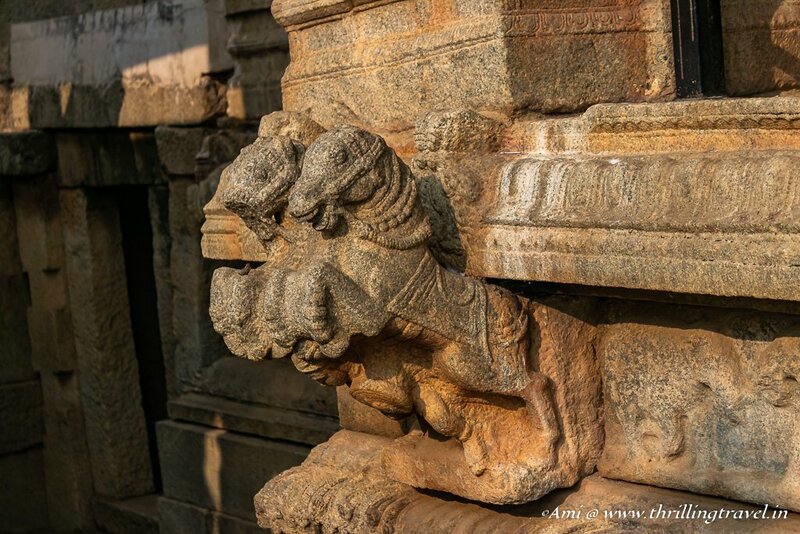 Check out the similarity between this Ganesha and Sasivekalu Ganesha of Hampi through this post on Virupaksha Temple Trail. Another gem that you should look out for while at the Ganesha shrine is a Bas relief behind it. 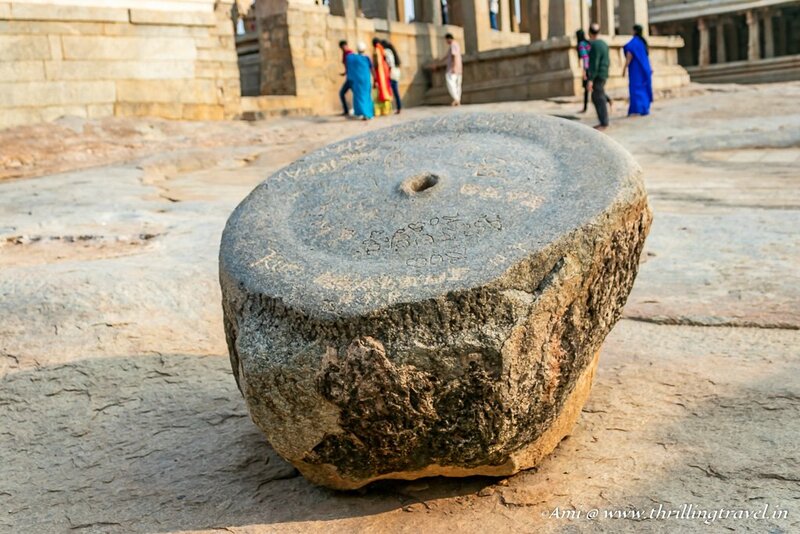 It showcases a prince or a warrior praying to a Shiva Linga. The one next to it shows an elephant. I could not identify the mythological significance here. Perhaps the artist meant to depict a slice of life from those days. If there is that one thing that I had to pinpoint as the most memorable part of Lepakshi temple, it would be this open air Kalyana Mandapa. This section of the temple was not finished. Work was stopped as the brother Virupanna was found guilty of embezzling. The incomplete marriage hall or the hall of ceremonies is an open air art gallery. Each pillar here is a showcase of an unknown artisan. From warriors to dancers and divine nymphs, every pillar is akin to a living creature. It feels as if each of them have just frozen into those stones. The details are just magnificent. When the brave Jatayu fought with Ravana, for a brief moment, Sita touched Lepakshi. Her foot got imprinted on the surface. 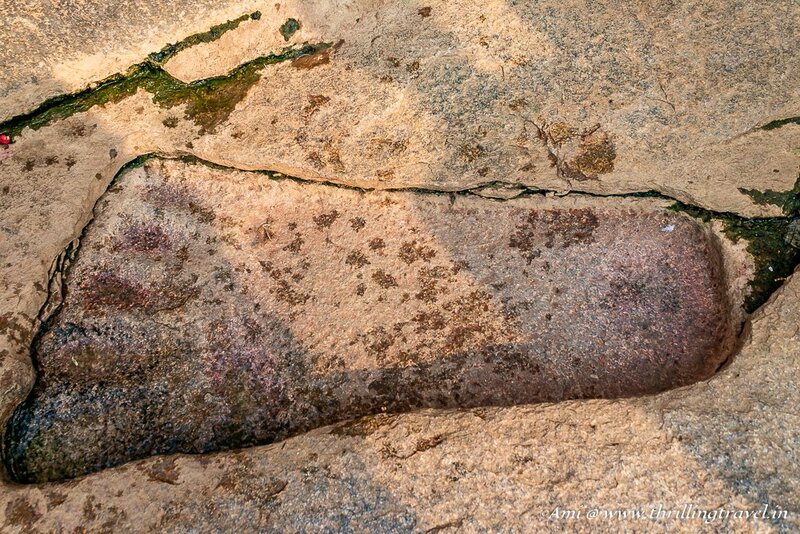 It is believed that the giant footprint that you see in Veerabhadra temple of Lepakshi is that very print. You will always find it wet. Even if you try to wipe the water away, it comes back. Popular belief has it that this is a divine way of paying respects to her. Around here, you will find unusual marks – almost like paw marks. However, if I had to believe the guide that I had at the Hampi enclosures, then these are place mats for a meal. 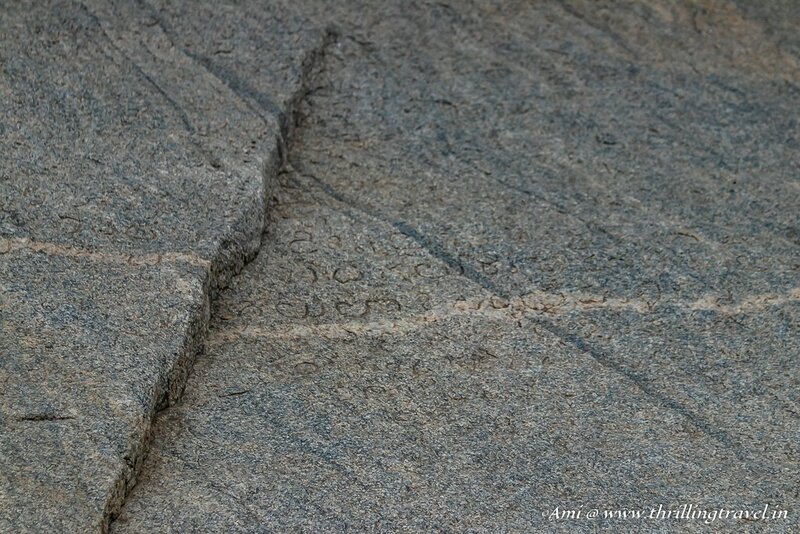 There were similar marks near the various aqueducts of the Royal enclosures of Hampi. 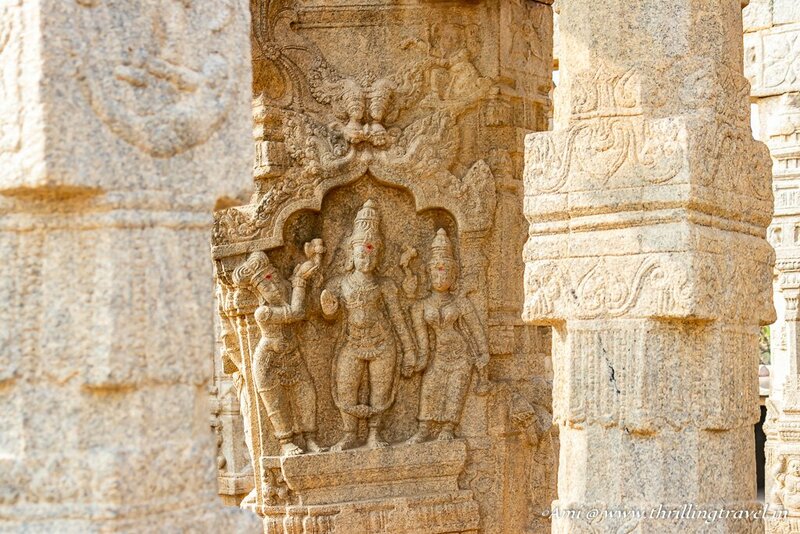 The main Lepakshi temple has three key chambers. The outermost is called the Natya Mandapa or the dance chamber, the next is the Ardha Mandapa or the Ante chamber and the last is the Garbha Griha or the inner sanctum. The one thing that will impress you in both the Natya Mandapa and the Ardha Mandapa is the array of over 70 carved pillars. Each pillar of the temple had a unique carving on it and merely going from one pillar to another can itself be a fascinating journey for any art lover. 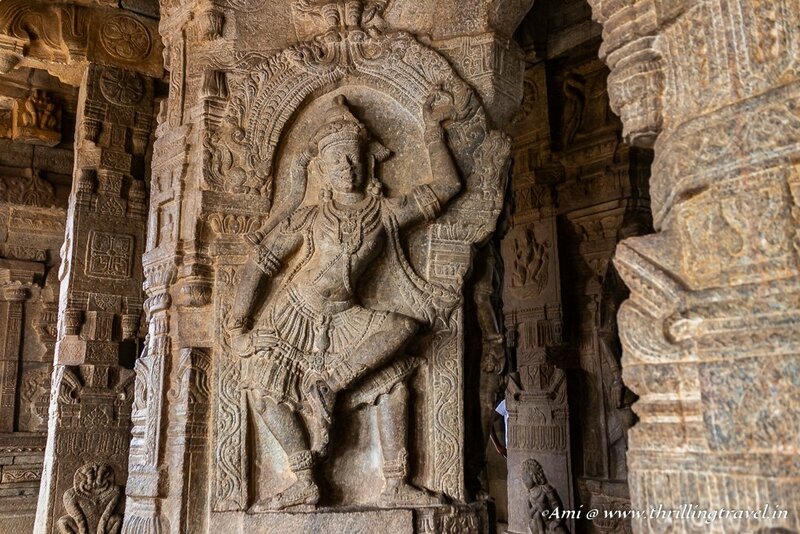 The ones in the Natya Mandapa showcase different avatars of Shiva and other Gods playing music or dancing. Take for instance this nymph called Brinhgi with her three legs. The ascetic was given a third leg after a curse from Shakti – the consort of Shiva. The ascetic wished to circle only Shiva and refused to acknowledge Shakti as the divine half of Shiva. He tried to separate Shakti by going between the two but failed. As a punishment, his feminine side (said to to flesh and blood) was taken away from him. The poor guy tried to stand but could not as he was just a bag of bones. After a penance, he was forgiven and given the third leg as a support. Quite like Bhringi, you will spot the other mythological stories on these pillars. It will take you over a day if you were decipher each one of them and this is where a guide can help you. They not only tell you the key stories but also, point out at the various other facets like this protruding bracket that you might otherwise miss. The one pillar that you must look out for it what they call the Hanging pillar of Lepakshi temple. It is to the left if you are facing the inner sanctum of the temple. It might actually seem as one of the least impressive ones – from a perspective of its carvings. However, this one hangs off the ground and you can see the gap. Not just by bending down but by passing your scarf or newspaper right through its bottom. One might say that it could have been a mistake and since the other pillars are all fine, the temple has not collapsed. So did this British Engineer until he checked it himself. Apparently he tried to dislodge only to realize that the ceilings and the other pillars were dangerously shaking. It was evident then that this was by design. Goes to show the architectural prowess of that time. The Ardha Mandapa has more than its share of pillars. A glance up at its ceilings will reveal gorgeous paintings. The details in these are still vivid owing to the vegetable colors that were used. These colors have withstood the test of time. What is more is that this stretch of 7 x 4 m ceiling is said to be the largest fresco of Asia. 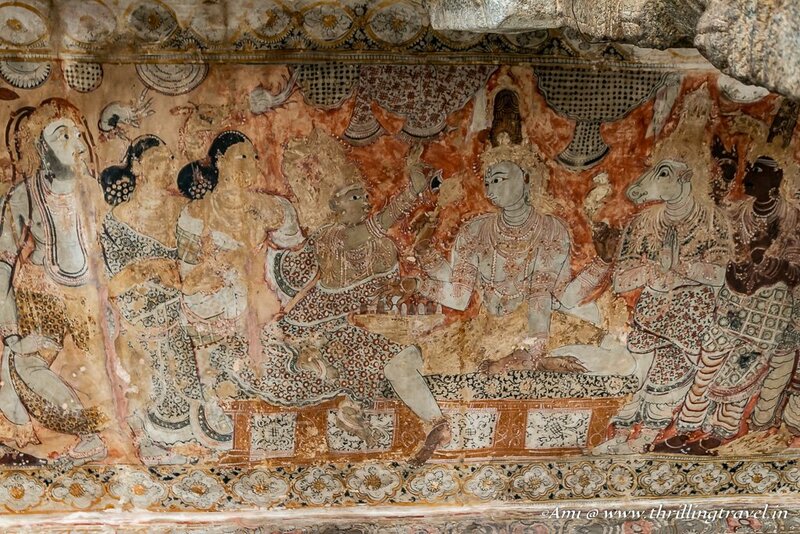 The paintings showcase various scenes from the life of Lord Shiva. You can spot around 14 of his avatars here. The Inner Sanctum has the shrine of the fierce form of Lord Shiva – called Lord Veerabhadra. The deity is adorned with skulls and is equipped with a lot of weapons. Besides this, there are shrines dedicated to Lord Vishnu, Ganesha and Shiv – Parvati. There is also, a beautiful pillar with Goddess Durga on it. The pillar can be seen with a mirror that is kept opposite it. The reason for this mirror is so that all the devotees get to see her. As the story goes, Goddess Durga did not wish to have a shrine of her own. She said that she would be happy with just a pillar. And thus, the arrangement. No photography is allowed in the Inner Sanctum as it is still a living temple. One can go in and see for themselves. Veerabhadraswamy temple is built on a tortoise shaped hill called Kurma Sailum (the name translates to the shape). Atop one of the peaks here, you can see a large statue of Jatayu. The place is more of a view point of Lepakshi. Atop this you can see the Veerabhadra temple and the Nandi bull. I frankly, gave this a miss as it had been a long day since we left Gandikota. It was time to go home and well, this being close to home, I hope to get there the next time. Lepakshi is a perfect day-outing from Bangalore with just enough to see. I highly recommend it for its unusual things to see – the hanging pillars, open air Kalyana Mantapa, the largest ceiling fresco, the Naga Shrine….and well, the rest of the list as above. So, are you game? The closest airport to Lepakshi is Bangalore Airport. In fact, from the airport, it is just 135 km by road. You can hire a cab from Ban\galore or hop into one of the many buses that go to Lepakshi from Bangalore. Where to stay in Lepakshi? There is only one APTDC Hotel in Lepakshi – Hotel Harita. This will need to be booked in advance if you wish to stay here. It is best to drive back to Bengaluru and opt for one of the hotels in Bengaluru. You can pick one from the many around, based on your location and budget. Carry your own food and water as there are no restaurants or hotels around the village. 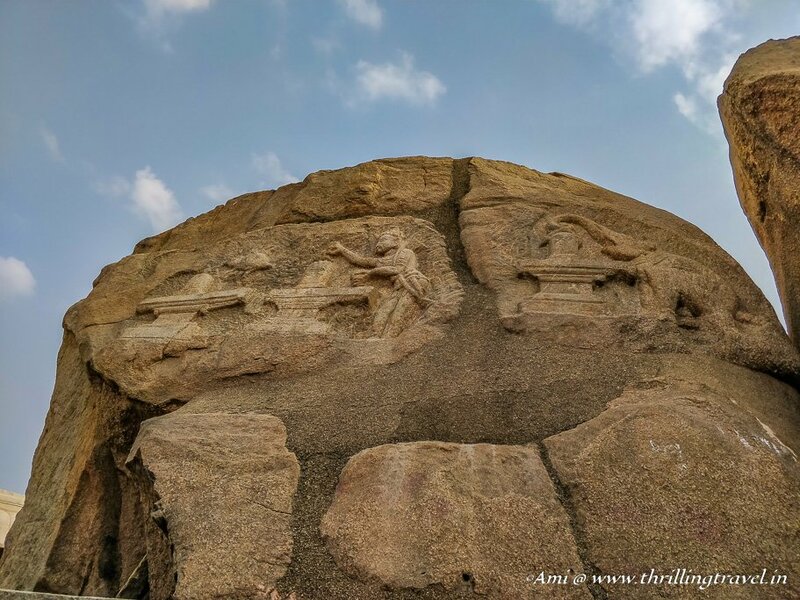 Lepakshi is known for it weaving and one might want to spend a little time browsing around Dharmavaram and Hindupur – around 1 hour away from this village. 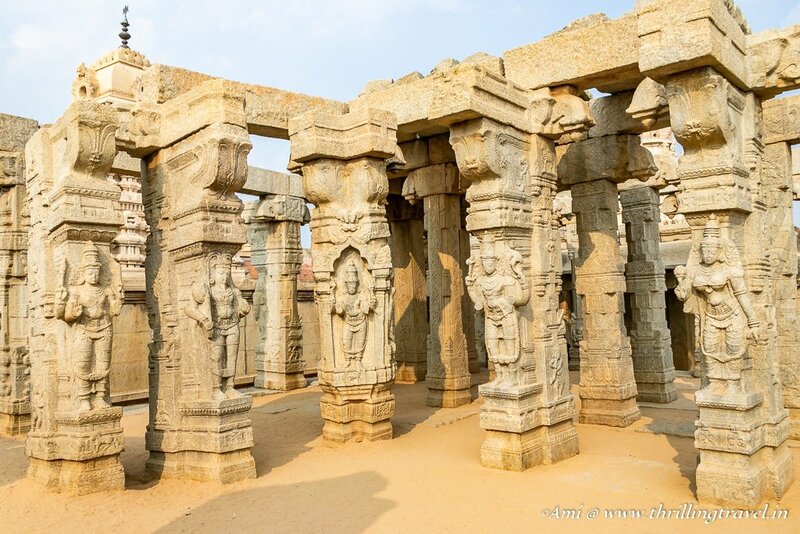 The Lepakshi Sarees are quite famous for their designs – all inspired by the carvings of Veerabhadra temple. There are no entrance fees to the Veerabhadra temple or the monolithic bull. You can hire a guide near the temple. It is advisable to do so as there are quite a few things to see within the Veerabhadra Temple. Remember to note the various Hindu rituals when visiting the temple – especially the way you dress. You can read through this guide to know them all. Disclaimer: This article includes affiliate links. This means that at no cost to you, I will receive a small    commission if you purchase through my link. Thank you for supporting me with this. You’ve been so many incredible places in India! Do you recommend travelers rent a car while in India or take the buses? Depends on the place Heather. In this case, with Lepakshi, I suggest hiring a car. The place is a little offbeat and there aren’t any tourist buses that go here regularly. I would not recommend the public buses. love the magnificent trove of sculpture and mural art! Cool, about the newspaper test with the pillar. Everyday you intrigue me more and more about India. Thanks for sharing your beautiful country. so many temples and such history in India always looks amazing. Looks like a great place to relax and have a picnic. Yep. Let the soaring temperatures get a little normal. And then head there. Great photos! The more I read your blog, the more I’m looking forward to be in India (in about 6 months, depending on how fast we will hitchhike through Central Asia). 🙂 And I am sure you are going to love it. Have a good time in Central Asia. Ooh! Ceiling murals! It’s so easy to forget to look up and see what details you’ll find. The temples look so great! So much detail in the designs! Thanks for sharing such great places in India! Planning to head there tomorrow morning.. you have been there at a very good time(weather) and the pics have come out well. Lets see how it is tomorrow. Hidden gem of Indian craftsmanship and rich culture, I must say. 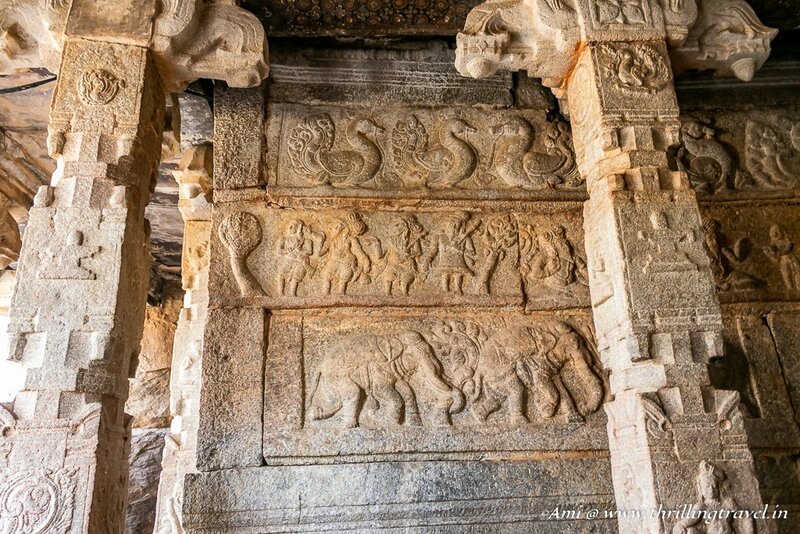 Felt as if, every corner at Lepakshi has some story waiting to be re told. Thanks for a visual tour of the place accompanied by the tid-bits of the history. Very engaging narration. Thank you Anagha. Your comment made my day. Always good to be appreciated. Its amazing, enriched my knowledge and attracting me so much. Stunning pics. Loved the post. I have never heard of Lepakshi! But then I have not had a chance to explore the south of India. Good to know that it is not too far from Bangalore, makes it easily accessible. 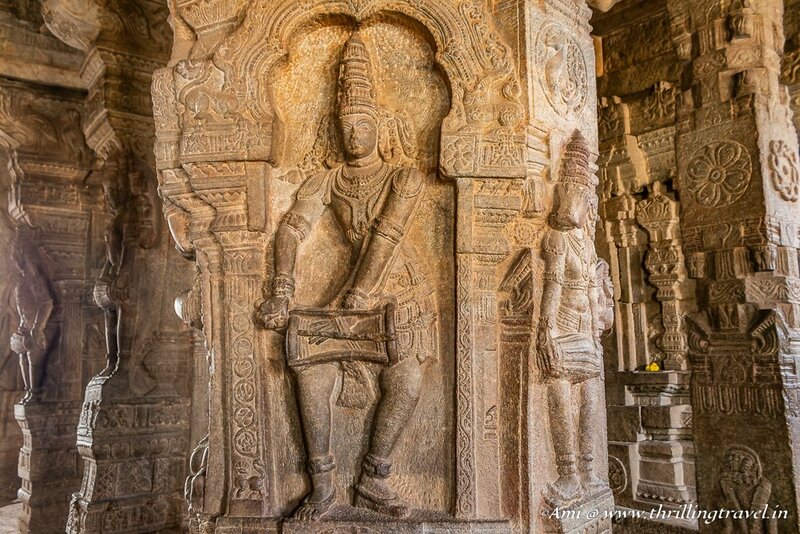 I love the beautiful carvings on the temples, the wall murals and the pillars. Particularly the Jatayu on the hilltop looks really intriguing! Next time you are in Bangalore, just set out for a day trip here. Am sure you will find it mind-boggling. 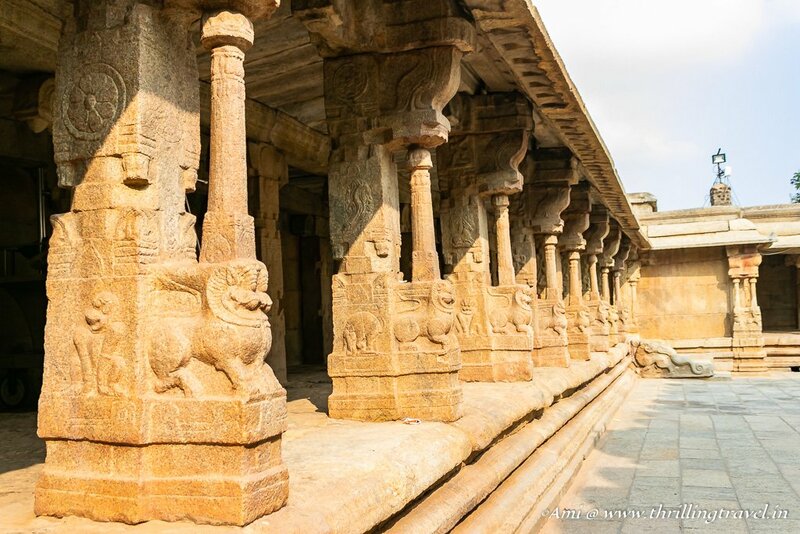 Lepakshi looks like it’s a hidden gem, with amazing carvings and a rich history. I’m sure there enough intriguing stories about the history of the temple and village to fill a book. Oh yes, it is quite a place. Am pretty sure you will enjoy it. Hope you can visit it sometime.